Simple holes torn in the decking, or hatched removed to drop into the subflooring/level below. Pits can be accidental (and deadly in a dark room) or torn by something/someone. Craydogs are especially fond of pits, and usually fill them with jagged fragments of decking as well as cover them with debris. Pit traps are easy to detect, a pole of probing will usually spot them, but they can be very dangerous, especially if they fall the hundreds of feet between decks. Disarming pits is not easy and involves filling or bridging them, but unless the pit totally fills a gangway (most often they don't as their makers desire passage) they can be avoided and sidestepped. Often a product of decay, especially from the vessel warping power of Crawling Death Fungus, whole sections of flooring can drop away in a crumbling mist of rust and fragments when weight is applied to them. Such weakened structure can wipe out entire groups of scavengers, as an incautious step breaks a decayed support and drops large areas of decking into a vault or collapses a structure. While serious corrosion and decay are not hard to detect, it's difficult to know if the decay is enough to cause a collapse. Simple probing with a pole or weapon is rarely effective, neither offering enough force to preemptively cause a collapse or enough distance to provide safety. Fragile areas are hard to disarm, though rumor has it that destroying Crawling Death in a weakened area will cause structural damage to repair itself over time. Avoidance is the best solution, but if a corroded section of the ship must be traversed, it's advisable to send a lightly encumbered scout forward on a long tether. A huge variety of dangerous explosives can be found aboard the Apollyon: from ancient annihilation grenades, to crude pipe bombs, or even vat grown pneumatic spore bombs. As traps explosives are both deadly and quick to set they are popular to those with the means to prepare them. Most simply a trip wire will be attached to the triggering device for a concealed bomb. Stretched across an open room or behind a door, explosive traps can be set almost anywhere, and vary wildly in the size and effects of the explosion they produce. The simplicity of most explosive traps and their clear mechanical nature makes them generally easy to defuse. Detecting and snipping the line to these bombs is usually sufficient. More complex explosives may use magnetic, pressure plate, heat detecting or even magical triggers, requiring a trained tinker to approach and defuse them. Relatively uncommon, areas of caustic chemical, magical or biological pollution are sometimes discovered in the vessel. The famous "pool of horror" incident where several young boys found a clear seeming pool of water in an unused industrial area of Sterntown and were promptly dissolved, along with two rescuers, after swimming, because of high acid concentrations in the water responsible for its clarity should be a lesson to scavengers. Other risks include magical radiation, mutagenic and caustic slimes (both mobile and stationary). Almost all of these risks are both hard to detect and fairly easy to avoid, making caution the key to avoiding death by contamination. Since caustics and mutagens are rarely used directly as traps or protections by intelligent creatures they are most often in the open. While some acids only work on metal and magical contamination often ignores the unliving, testing strange liquids with poles, small animals or the end of a rope is often advisable, especially when the liquid appears confined to a small space. If caustics must be handled, protective gear is advisable. Ebonite items are almost always proof against acid, and metals frequently provide limited protection, but even cloth or leather can act to protect the wearer long enough to be torn off and discarded. Gases also fall into this category, including sealed or below waterline areas of the hull that may look safe, but are devoid of oxygen or contaminated by poisons. The undead of the Ash Plague are known to commonly use traps of this nature as they are almost universally immune to asphyxiation, poison and other non-corrosive gases. Additionally living creatures killed by poison or gas tend to be in relatively good physical condition, allowing easier "recruitment" into the undead armies. One special issue for Apollyon explorers is the abundance of "black water" aboard the Apollyon. Salt water found in the deeper, flooded, parts of the hull has an almost universal effect of raising dead tissue into undead horrors. While this process often takes days or weeks, it can be very unpredictable depending on the concentration of necromantic energies involved. In all cases it is wise not to leave any corpses submerged in standing water or damp areas, as ones former enemies (and allies) are likely to attack anew. from simple spring or torsion traps to more complex machines using gears, pneumatic darts and hydraulic rams, mechanical traps tend to be relatively rare in abandoned areas of the hull. These traps often require continued maintenance, though a few (such as deadfalls) can remain effective for centuries. The product of malicious and intelligent intervention, mechanical traps are some of the more likely traps to have back up traps or to be trapped themselves. When mechanical traps are discovered, it is almost always worth remembering that the trap maker is likley nearby, and that the trap, in addition to being dangerous, will usually act as an alarm. For this reason setting off traps such as spring loaded spikes or arrow traps as a means of disarming them is not always advisable. Most mechanical traps are designed to be avoided or bypassed so that their owners can pass by without endangering themselves. Stepping over, or ducking under tripwires is a classic example of this, but other variations such as climbing along a rough wall or stepping on a concealed switch are all options. The makers of mechanical traps will often also mark trap locations with symbols and diagrams that tell allies or remind the trap maker of how exactly to avoid the trap. Scavengers out of Sterntown often use a heart based code with the location of the heart (painted on one side of a hallway for example) or a portion of the heart broken off to indicate where a trap is located. Other races and beings use different trap codes, and may even label traps falsely in an effort to trick particular enemies into a trap, rather then warn against it. While "Spore Bombs" or bone fragment bombs have been mentioned above, and are popular among certain cultures aboard the Apollyon (Merrowmen especially) some of the varieties of otherworldly fungus aboard the ship have their own defense mechanisms that are best considered as traps. Spores from various molds and mildews are often dangerous, the most common and well known being the spores of the black mold, which causes terror and flight. Other fungus and plants will entangle or explode, launching seeds or spores into targets with lethal speed. Most of the dangerous mold,slime and fungus aboard the Apollyon has organically arrived at its location, growing in some sort of nutrient rich spot and using its toxicity to defend itself from predators. Some intelligent creatures will cultivate dangerous molds and slimes, weaponizing them or filling chambers with deadly plant life as a means to guard their lairs. In the case where dangerous flora is cultivated, there is often another way past, or at least a hidden path between carefully placed plantings. The most common means of dealing with dangerous molds or fungus is to burn it, but this has its own dangers, as the smoke given off by such burning is often toxic. Other than carefully cataloging the traits of specific plants and fungus, or the use of specialized serums and magical elixirs to destroy dangerous fungus, the simplest mechanism for dealing with dangerous spore producing plants is to douse them in large amounts of water. Frequently wetting a deadly mold down will prevent it from producing the dangerous spores it uses for protection and the infestation can safety be bypassed. Beyond dangerous plants and molds, animals can sometimes be used as a trap. Sterntown Vics are the most obvious example of this, with a sack of the slumbering animals rigged to open when walked beneath or a hungry Vic trapped inside an important looking box make dangerous traps that are extremely simple to set up. Other races use trap animals as well, with Merrowman flesh ripping crabs, barbed squids or burrowing centipedes are an effectiuve subsitute for Vics. The Ash Plague has some of the most effective animate traps, though being undead they cannot be called 'biological' in the proper sense. Biting animated skulls, severed claws and similar unthinking undead can be left in place for years and remain ever dangerous to intruders. 6. Flame Traps Non magical flame traps provide even more upkeep trouble then complex mechanical traps. In the simplest form, a pool or coating of oil that ignites when the trap is triggered an element that creates flame is still necessary and needs to be kept burning. More common are defenses that are actively manned and utilize flame. Hidden murder holes are a favorite among Merrowmen (though the eelmen enjoy mutagens more than flame, flame works on a wider variety of enemies). The intelligent rats of the Parliament of Tails are also especially fond of flame traps, as a rat with a punk or even a fanatical rodent willing to immolate itself can often light an oil slick trap before it's spotted and fire is a very effective weapon against even large foes. More complex flame traps requiring volatile gas are occasionally discovered, and the Black Gang has religious reasons for the use of flame traps, as well as the technical ability to plant sophisticated traps involving pilot lights, gas vents or hoses that spray flaming adhesive oils. Contrary to common sense, underwater areas may be the most effective for the use of flame traps because certain substances burst into violent combustion when they come into contact with water. A sealed canister of quicklime, opened with a trigger makes a dangerous trap on an underwater hatch or in the confined space of a pipe. In almost all cases the best wave to detect flame traps is by smell. Only rare fuels for flame traps are odorless, and many have distinctive odors that can be detected from a great distance. Likewise the delay in triggering flame traps means that they can be avoided by retreating rapidly when dangerous combustibles are first detected or introduced into a trapped area and most flame traps are easy to trigger prematurely with a thrown torch. 7. Magical Traps Magic provides incredibly long lasting and powerful traps that are beyond the skill of most scavengers to detect or deactivate. From the numerous symbols with negative effect, such as insanity, pain, rage, death, hopelessness that need only be seen to effect intruders, to explosive runes that require triggers magical traps can be found almost everywhere. Some of the most common magical traps, and the easiest to create, are simple fetishes which curse intruders. 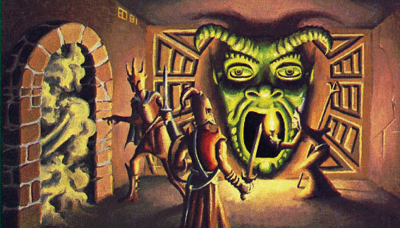 More complex magical traps, such as those in the Marine 'Sigil Maze', do very strange things - turning men against their comrades, sucking intruders into otherworldy vortexes, melting flesh or mutating the unlucky with magical radiation. 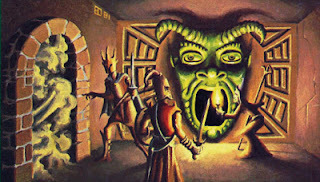 Some of the worst magical traps involve the simple mechanical expedient of trapping and dangerous outsider entity within a set of runes that will be disturbed if a door is opened or room disturbed. With the trap unsealed the hungry and enraged outsider will hunt down and devour those who free it. The only real protection from magical traps is to have a sorcerer on ones side who is powerful enough to dispel the magic of the trap. Without direct intervention it is worth remembering that magical traps are the product of intelligent intervention and often have a fail-safe or special means of disarming or bypassing them built in to protect their creators. If a scavenger can learn this these traps are often the safest and easiest to disarm or even turn against enemies.